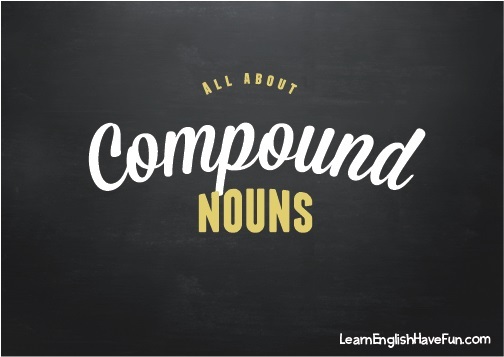 Compound nouns are nouns that are made up of two or more words. Most (but not all) compound nouns have two words. The first word usually describes the person or thing and the second word identifies who or what the thing is. ice-skater (noun): Carolina Kostner is one of my favorite ice-skaters. ice-skate (verb): We ice-skated at the rink last night. ice-skates (noun): My ice-skates are white. makeup (noun): I don't usually wear makeup. make up (verb): I can't make up my mind which makeup to buy. Closed form: formed by two separate words joined together. Keyboard, notebook, postman, football, housewife, moonlight, eyebrow, eyelid, lawsuit, toothpaste, haircut, bedroom. mother-in-law, five-year-old, ex-husband, one-half, dry-cleaning, well-being, baby-sitter. Open form: there is a space between the two words. Even though they are separate, both words together make the noun. post office, full moon, vice president, ice cream, swimming pool. Even native English speakers struggle with this. Although we can use compound nouns effortlessly in speech most mother-tongue English speakers have to carefully think or use spell check or a dictionary to know if these words are open, closed or hyphenated. Let's look at a few examples of by word classes. Finally, remember when in doubt, consult your dictionary for the correct form (open, closed or hyphenated).